BlueStacks Requires a good Graphics Card or Chipset and RAM (Minimum of 2GB) for its Proper Functioning so that it can run all the Android Games Smoothly.Latest Android games demands Powerful Graphics handling capable devices otherwise they will not run on your system.How to Download Play Store Apps on PC Most of the Users are seen facing the error ‘Bluesacks currently doesn’t recognize your graphic card.It is possible your graphic drivers may need to be updated, Please update them and try installing again’ while running the Android apps or Games.So here I have some tips that you may apply on your system to fix this Bluestacks Graphic Card Error. Note – Though these tips doesn’t guarantee to fix this Error but these tips have helped a lots of users to play their favorite android apps or games on their system.Therefore It totally depends on your system Configuration. If You Are Using a Laptop then make sure that your Laptop is running on a live Power Source since sometimes graphics card demands great power which is not handled by the Laptop batteries therefore try connecting Your Laptop to a Live Power Source and then Run the Android apps or games. Update Your Graphics Drivers.It is necessary to regulary update your graphics driver so as to provide support for new features. Note – Also Keep Your DirectX Up-to date. Hope these tips fixes your Problem. Note – If you still face the Same Error then its the time to buy a New Graphics Card for your System to Run these android apps or games on your system. Actually i dont have a graphics card on my lappi and i wanna instaall bluestacks can uhelp? 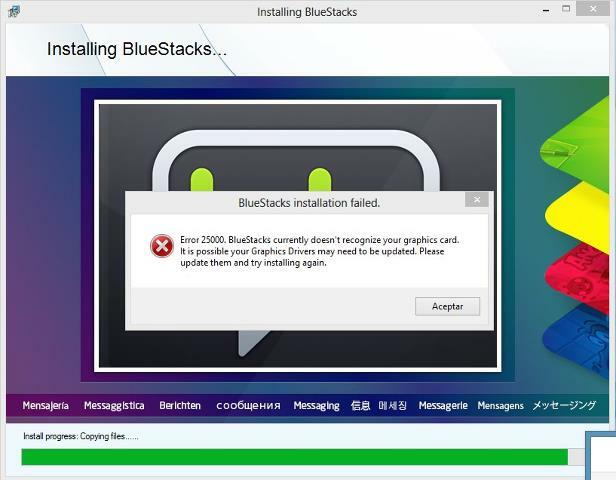 Bluestacks Require a Good Graphics Card to Run So if You don’t have a Decent Graphic Card on Your Laptop it will not Run….But You can Still Try Updating Your Graphics Driver May be that Can Help…. It Requires a Good Graphics Card or Chipset to Run but if you don’t have it you can give it a Try After Updating all your Graphics Drivers…This has Solved the Problem for Many People…. You can Just visit the Intel Official Driver Udpate Page as given in the Post and there just Select your Chipset model and Download the Udpate and Install it……..
Actually I was able to run bluestacks on my oc when after a month it stopped working. I uninstalled and installed it again. then I updates my latest drivers from the intel’s website. But the error still exists. I have a 3.3ghz i5 Processor, 4gb RAM, INTEL HD graphics &windows 7 ultimate. What Intel Graphics Chipset do you have ? ?….Have you Installed all Graphics Chipset Drivers i.e Graphics Media Accelerator and Chipset Drivers….Make Sure to Install them Properly..
Boss i have 1.5gb ram,with older version graphic card ,help me how can i up grade, i use window xp. Just Upgrade Your RAM to 2GB and Buy a PCI Express Graphics Card But Make Sure you have a PCI Express Slot on Your Motherboard…. Just Open Run Box and Type dxdiag and Press Enter Now a New Window will Open There Select the Display Tab and You will get all your Graphics Card Details…. You can Try Using Youwave Android Emulator as bluestacks alternative….. It is difficult to upload photo on whatsapp using youwave,can u suggest how to do so? Sorry Friend I haven’t tried YouWave but if I get to know i will tell you for sure…. I’m tryin to install bluestacks but it takes forever, please suggest i’m using new HP windows 8 and i dont know how and where to check the graphic card. PLEASE HELP! Sorry Bro You can’t run Bluestacks then on your PC But you can try another similar app YouWave though I have not tried it…. i m using radeon 1gb graphic card is there any drivers required? Which ATI Radeon are You Using ???? how to update graphic driver on our pc….? Just Find the Latest Graphics Driver for Your PC From the Above given link and Update it directly or either you can download it as a setup and Manually install it…..
i have amd athlon x2 270 processor kingston hyperx blu 4 gb and a xfx radeon hd5670 ddr3 1gb graphics card… so can bluestacks support in my system. ?